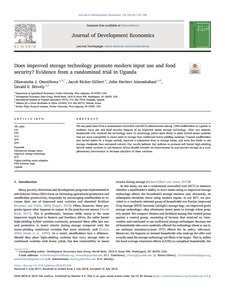 We use panel data from a randomized controlled trial (RCT) administered among 1200 smallholders in Uganda to evaluate input use and food security impacts of an improved maize storage technology. After two seasons, households who received the technology were 10 percentage points more likely to plant hybrid maize varieties that are more susceptible to insect pests in storage than traditional lower-yielding varieties. Treated smallholders also stored maize for a longer period, reported a substantial drop in storage losses, and were less likely to use storage chemicals than untreated cohorts. Our results indicate that policies to promote soft kernel high-yielding hybrid maize varieties in sub-Saharan Africa should consider an improvement in post-harvest storage as a complementary intervention to increase adoption of these varieties. Omotilewa, O.J., Ricker-Gilbert, J., Ainembabazi, J.H. & Shively, G.E. (2018). Does improved storage technology promote modern input use and food security? Evidence from a randomized trial in Uganda. Journal of Development Economics, 135, 176-198.